Around the year 1850 neo-Gothicism was maturing and increasingly became a Roman Catholic style almost exclusively. 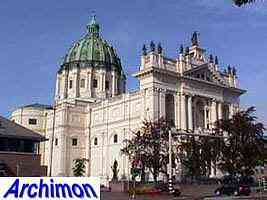 For the next four decades only few catholic churches were designed in other styles, until at the end of the century neo-Romanesque became more important. The protestants on the other hand started to look for a style of their own, from now on rarely building in a pure neo-Gothic style, although elements of Gothicism continued to be used in combination with other styles. First there was Eclecticism, a style in which elements of various styles were mixed, of which Romanesque was the most prominent. 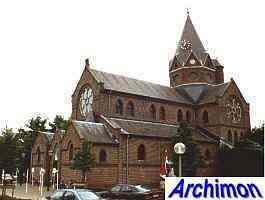 The reformed church in Gorinchem (ZH) from 1849-1851 is a typical example. Here neo-Classicism is mixed with elements taken from Romanesque architecture. The contrast with the medieval Gothic tower could hardly be bigger. 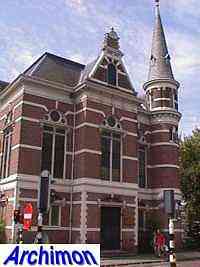 Even more ecclectic is the Keizersgrachtkerk in Amsterdam (NH), built in 1888-1890 for the Gereformeerden, a split off branch of the reformed church. The church, which was designed by G.B. and A. Salm shows influences of early Gothicism and Venetian Renaissance. After ca. 1875 this Ecclecticism gradually vanished from profane architecture, where it was replaced by neo-Renaissance; another ecclectic style, but this time based on Mannerism, the indigenous variant of Renaissance of the late-16th and early-17th centuries. Neo-Renaissance was favoured by the government as well, as it referred to what was then believed to be the most glorious moment in the history of the Netherlands, the war against Spain and the foundation of the protestant Republic. The style was soon adopted for protestant churches of all denominations until being replaced by Rationalism at the end of the century. The reformed Nieuwe Kerk in Scheveningen (ZH) is a classic example of a neo-Renaissance church, mostly built out of brick and with many details taken from Manneristic architecture. The tower for instance was inspired by the work of Hendrick de Keyser. It dates from 1893 and was designed by Roelof Kuipers, brother of Tjeerd Kuipers who also designed his first churches in this style. Protestantism was divided in several different denominations, but neo-Renaissance became popular with most of these. 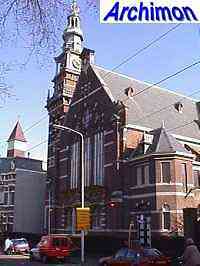 The Remonstrant church in Haarlem (NH) is only one example. In several ways it's very similar to many houses from this period. Despite the preference for neo-Gothicism, a few catholic architects did design in other styles. Even P.J.H. Cuypers, who designed the basilica in Oudenbosch (NB), a scaled-down copy of the St. Peter in Rome, built 1867-1880. 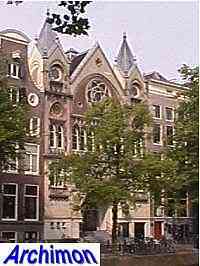 Of more architectural importance however is the St. Nicolaas in Amsterdam (NH) Architect A.C. Bleys actually used the 'protestant' neo-Renaissance style for some of his churches, although mixed with Baroque elements, reason why his style is often referred to as neo-Baroque. 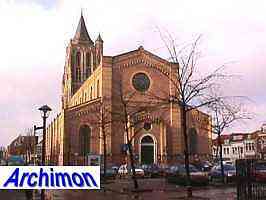 Another style that was of some importance to catholic architecture was neo-Romanogothicism, based on the late-Romanesque architecture of the Rhineland. The first church in this style was this O.L. Vrouw Geboorte in Ohé en Laak (L), designed by A.C. Bolsius and dating from 1865-1867. In the 1880's C. Weber designed several churches in a similar but much more refined style.